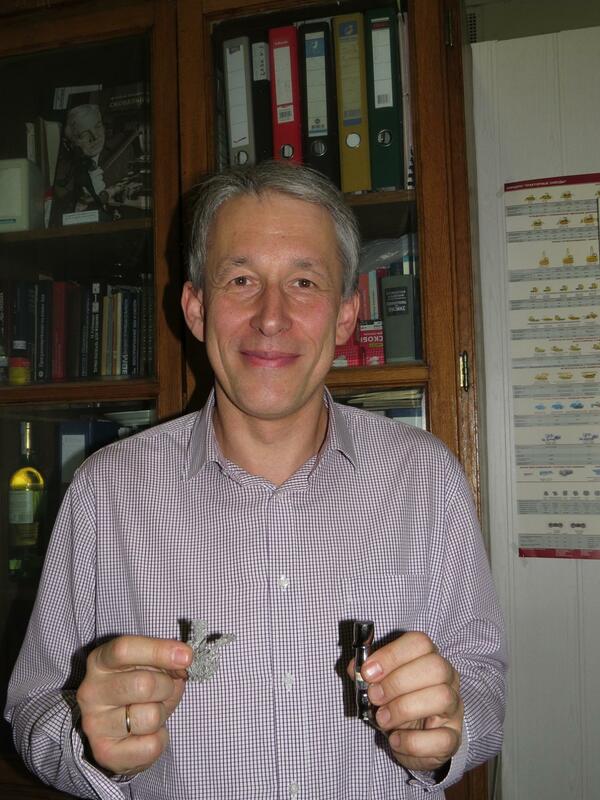 SINP scientist Alexander Chepurnov with the samples of Titanium with low content of radioactive elements. Photo by Oleg Barinov. Currently detectors of dark matter are manufactured from stainless steel with ultra-low content of radioactive elements, whihc is not produced by the order of the scientists, but collected from the produced batches. Content of radioactive elements, for instance, Torium and Uranium isotopes is minimized, because the products of their natural decay copy signal of the expected very rare process of interaction - collision of the particle of dark matter and atoms of typical matter. Majority of scientists consider that most probably WIMPs – Weakly Interacting Massive Particles - are the first candidates for dark matter. During the past 20 years a lot of experiments were intended for the searching for WIMP, but they are still not found, although billions of such particles surround us. It is proved by indirect data, obtained during the experiments. WIMP are so numerous, that their hidden mass influence on Galaxies - on their formation and anomalously high rotation rate of the outer ragions of Galaxies. In spite of the Earth, rotating with the Solar system around the center of our Galaxy Milky Way, crosses clouds of WIMPs, experimenters have observed none particles due to their properties. These mysterious particles provide so low probability for collision with typical matter, that it is necessary to develop larger and larger detectors for their registration. In the near future occaisionally manufactured stainless stell with low content of radioactive elements will be not enough for the production of the significantly larger detectors. For isntance, the scientists are going to increase sensitive volume of DarkSide detector in order to increase probability of WIMP detection. Currently it includes 50 kg of liquid Argon, in future they plan to use 3 tons of it. "While currently we need several hundred of kilograms of low-background structural materials, in future we will need dozens of tons. If we succeed in production of low-cost low-background Titanium due to using of well-known industrial technologies, it will be possible to use it for all future low-background experiments instead of stainless steel. Currently, Titanium is asspoximately four times more expensive than stainless steel," - SINP researcher Alexander Chepurnov told us. DarkSide is an international project developed by Italian, French, Polish, Ukranian, Russian scientific organizations and 17 Americal Universities. Russian representatives are SINP, Scientific Research Center "Kurchatov Institute", Joint Institute of Nuclear Research, Scientific Research Nuclear University "Moscow Engineering Physics Institute". DarkSide experiment is carried out in a low-background National Laboratory Gran-Sasso inside the mountains, which can be reached through a 12-km long automobile tunnel. Experience and expertise of the participants, accumulated during the development and carrying out of the low-background experiment BOREXINO on the studies of neutrino, which was carried out at the same Laboratory, form a basis for the expected success. 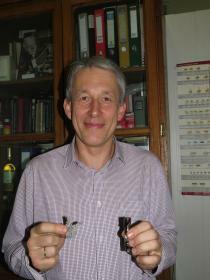 Currently Russian ultra-pure Titanium is considered as a candidate for structural material for the future large detector for the DarkSide experiment. The scientists made a decision basing on the results of the studies of Titanium sponge production, which were conducted at Solikamsk Magnesium-production Plant. Russian scientists have shown that it is possible to manufacture super-pure Titanium sponge, i.e. basic material for Titanium semi-product. Manufacturing of Titanium sponge can be based on the industrially widely used Kroll process, and metallurgic methods for the treatment and purification of Titanium sponge will allow to manufacture ingots of super-pure Titanium. "Titanium is a structural material for the dark matter detector, which initially can be manufactured radiationally pure. Taking into account this fact and leadership of Russia in the field of Titanium production, we can manufacture it. Close collaboration with Solikamsk Magnesium-production Plant, which has up to the minute equipment for titanium sponge production, provides a basis for the supplying of the future experiemtns on the search for dark matter with super-pure Russian Titanium," - Alexander Chepurnov explained. He also told us about his plans in this field: "At the next stage of the studies we'll have to practise the methods for the production of Titanium parts without radiation pollution, for instance, during the laser welding and cutting". Production of Titanium with low content of radioactive elements is interesting not only from the point of fundamental particles physics. Churlish pure metals production is a top-priority task for solid state physics and super-pure metallurgy. Such metals are also actual in the fields of microelectronics, physical material science and medicine.